Mr. Postman Large Satchel by Kathy Van Zeeland. The Kathy Van Zeeland store opened in Lebanon a while back (not quiet sure when exactly? ), and I never gave it much thought. None of the bags stood out to me or screamed "come buy me NOW".... I would look at the bags on display and just walk past them. Never stared to admire any of them, not because they're not pretty or anything, just not my cup of tea. When it comes to bags, as with most of my fashion items, I like them classic but with a fun twist -whether it's a bright colour or a bold pattern. This bag definitely qualifies as my cup of tea. 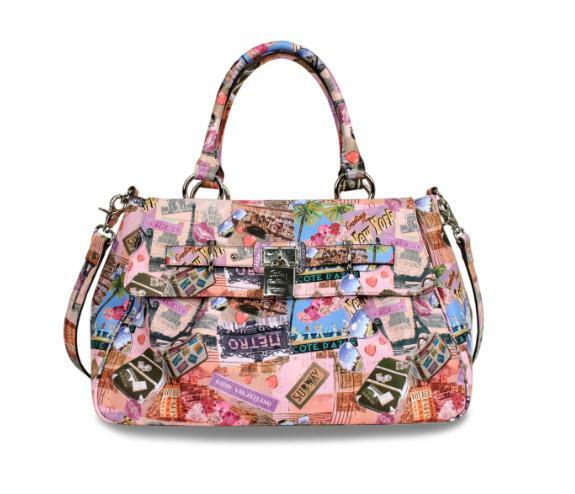 Classic satchel shape, but with a very loud graphic print of postcards from around the world. It might be a bit TOO loud for some people, which is understandable, but I'm definitely going to check out the branches in Lebanon to see if they have this in stock. Speaking of Van Zeeland stores in Lebanon, they have a %50 sale going on right now so make sure to check it out!